The news is full of stories about the state of the publishing industry. Change is everywhere. Debates abound as to who is responsible: big publishing houses, online stores or the meteoric rise of ebooks. Publishers, large and small, are leaving the tasks of marketing and promotion up to the author. If you're not already a best selling author, what's a writer to do? They need to do it themselves. The problem is that while most authors are aware they need to promote and market their book, they have no clue how to go about it. There are hundreds of resources teaching a writer how to create character and develop plot, how to format book proposals and how to pitch to literary agents and publishers; but very few on how an author implements success after the book is finished. Can an author promote an ebook the same as a print book? Is a self-published book as easy to market as a traditionally published book? The questions can be overwhelming and locating the answers, even trickier. 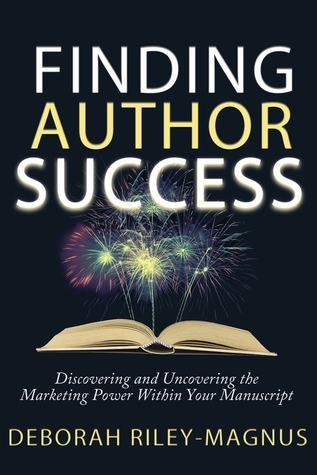 Welcome to Finding Author Success: Discovering and Uncovering the Marketing Power Within Your Manuscript. Deborah Riley-Magnus, an author and author success coach with years of successful marketing and promotion experience, takes tried and true marketing, publicity and promotional strategies and tailors them for the unique needs of today's author. Every element is outlined and explained for easy implementation. You will learn: How to develop a functional and strong book business plan;The power of developing effective, targeted platforms;The basics of publicity, marketing and promotion;How cross marketing works and why it's magic for an author; and, How to personalize it all to your book. I confess that I bumped this one up my TBR pile for two reasons: firstly, it was only a short book I could get through quickly and secondly, I have a new release coming out in just over a week and I was hoping for some last minute tips to help me promote and publicise my work. I have previously read and enjoyed some of Deborah's fiction and knew her to be involved in coaching, so I was very interested to see what pearls of wisdom she would have to offer in this non-fiction book. Certainly the book has shown me some gaps in my approach to promoting my books and I plan to adopt several of the strategies she outlines. Not all her ideas will work for me, but it is great to have such a wide range of ideas to consider. If you are an author, whether self-published or traditionally published, I can recommend this book as a great guide to finding your market and learning how to make it work for you: a wonderful resource.